Last edited by Gizmo; 11th October, 2006 at 07:41 PM. I've been planning on doing something like this, only I am going to make a homebrew UPS with a car battery, inverter and charger. I'm also considering attaching an 800 watt wind generator so my electronics will use little to no grid power! Solar power is not an option in WA. Are the batteries really that cheap? I have a 600VA Liebert Powersure here, with two 12V batteries in series giving 24V total. I talked to Aidan about fixing it, but it seams I can only get 1.2V across both batteries. I thought the batteries would be worth more than the entire unit, but perhaps not. Lead Acid batteries are pretty cheap these days. I'm guessing that even if you do spend what the UPS is worth on good batteries it is still going to be a lot cheaper than buying a new UPS that comes with the capacity you have just added. My SU1500 uses a completely different battery isolator! As far as the USB port goes - my SU1500 has both serial and USB. I guess I should take a look at how to communicate with it via USB at some point! My Liebert still uses a parallel port, so I guess its a little long on the tooth. I think its around '95-'97 from memory. Would it be worth getting a new one, or making this old one work again do you think? Parallel port? 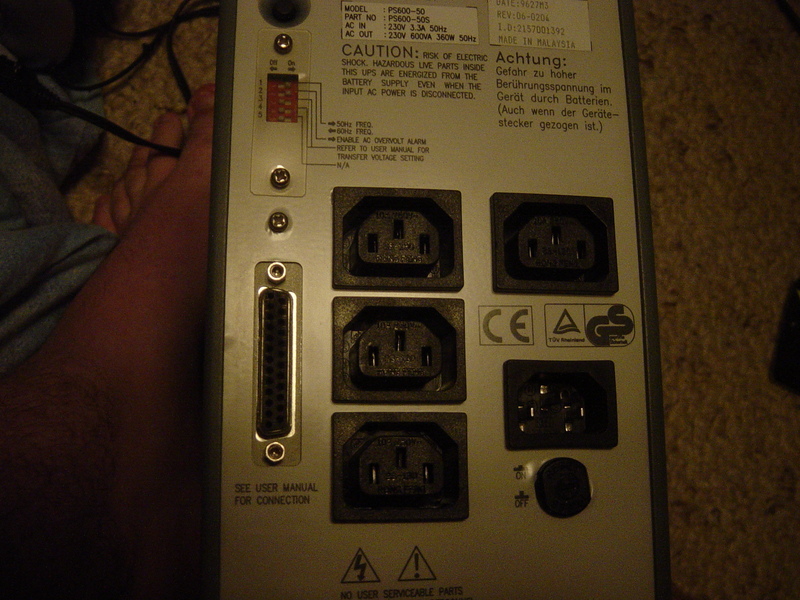 I wasn't aware that anyone made a UPS that used the parallel port! Are you sure it's not a 25pin serial connector? Interesting question. I assumed parallel, but it could well be 25 pin serial. Heres the back of it. To be honest, I'd expect it to be a standard 25 pin serial connector. There's no reason to make the thing parallel - UPS devices don't need high speed data transfer! I just didn't think it would be that old. The software it shipped with is Windows 3.11 / Windows 95 compliant, so I guess it is rather long in the tooth. Being that old, it may be a ferro-resonant unit, as well. I've got the Chloride GES-302n203 and it uses 96 volts worth of batteries (X8). I think it's a 3000watt does anybody know how long these should run one PC for? 3000w is a heck of a lot for a UPS. Mine is about 700w and will run my PC, monitor, router, the lot for about 20 minutes. Monitor is an LCD. So, maybe 1 hour or so with yours. Depends on how much power your system draws and the condition of the batteries. Well I only just got it and it is here at work with me now and I'm just MegaPulsing the batteries to bring them back to new condition so I've not yet plugged it in. The only Chloride UPSes I can find in the 3000VA range use a 96v battery system and are of the double-conversion online variety. I can't find a model number that corresponds with what you have, but I'm guessing that this is the same unit. According to the data sheet, it should be able to provide 28 minutes of run-time at 35% load. Assuming a typical PC with monitor, I'd guestimate your nominal load at about 300VA, which is only 10% of the load capacity of the UPS. That means that it should run something in the realm of 90 minutes before the batteries are flat. But that is just a guess made with incomplete data. If you have the management software for the UPS, and a serial cable to hook it up with, you should be able to configure it for a calibration run, and then you can get an accurate idea of the run-time.